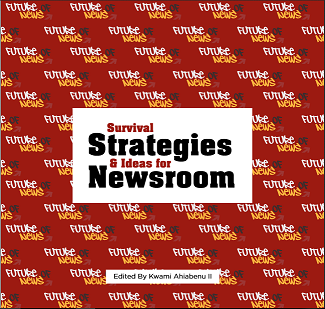 This book is the outcome of informed perspectives on the application of new digital technologies in the newsroom. It summarily provides insight into the "Future of News" by highlighting current and future trends needed to stay relevant in today's news generation and dissemination process. The important newsrooms concepts emphasized include Wearables technologies, the place of Newspaper in a technology driven space, Key trends in the newsroom and Ghana's place on the Global stage of Digital Media. The Chapters are a compilation of a series of articles written to mark Penplusbytes "Future of News" Forum in Accra on August 28th 2015 and are well organized to help readers acquire some useful background on new technologies in the news world as prelude to a more concerted eﬀort to get the Ghanaian news ecosystem to embrace the future.